In early 2013 I was contacted by a dentist who asked me for a full website development. This was for a brand new dental practice website. 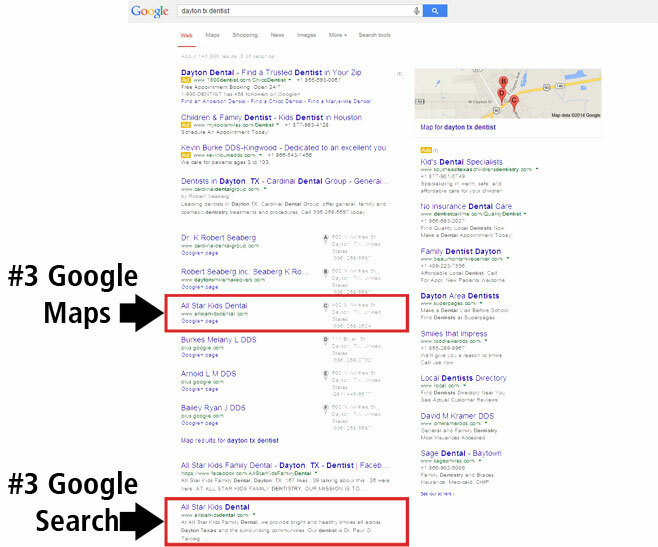 Normally a brand new website takes a while to show up on Google Search and rarely does well without specific dental SEO. If you are interested in what makes for good seo in general, check out my explanation of how to get a high seo ranking. When I build dentist websites, I am aware that my clients are not looking for a showpiece, they are looking for clients and a financially viable practice. This is never more so than with a brand new practice. So for me a full website development includes base SEO. When I started building websites I would just put a website and judge myself on how good it looked and if it worked as expected. I was shocked to find clients disappointed with my services. It took me some months, but I finally realized that if a website does not get SEO done right from the word go, it does not perform well, does not attract much traffic and generally is considered a flop, no matter how pretty it is. I quickly discovered that there is nothing more disappointing than a website that gets absolutely no visits other than the owner and his wife. So I changed my ways. I make good looking websites, but when I build I am investing a lot in the base SEO of the site. When I started to do this I had a few surprises. A dentist’s website for which I was paid not one dime for dental SEO as a specific service – turned up ranking well in Google search within TWO weeks of going live. This is, to my knowledge, unheard of. However another dentists website that had been built without dental SEO and which got poor starting rankings required a LOT of work to get it moving. It seemed to me that the “out of the gate” performance was a strong influence. I noticed that this happened more often than not and so it was again with one of my more recent websites- www.allstarkidsdental.com. 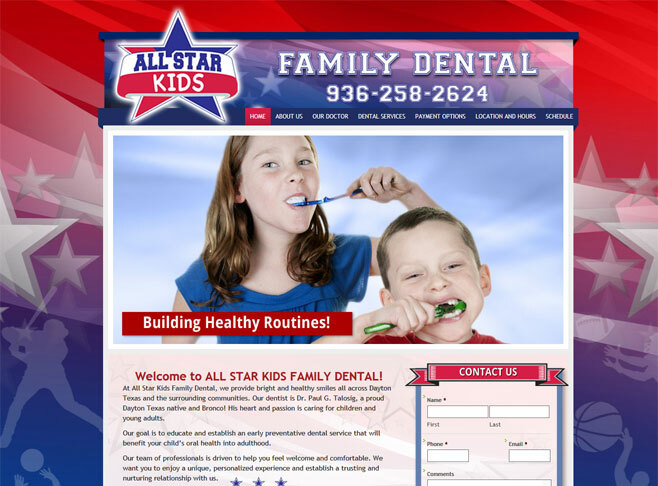 Searching “DAYTON TX DENTIST” in Google search shows that my All Star Kids Dental Website ranks #3 in google maps and #3 in search- showing twice on the first page of google results. Interesting because the dentist concerned simply puchased a website and never paid a penny for SEO. In my mind this is more evidence that starting SEO gets extra points from google. When I started doing dental SEO I found that generally brand new websites were very poor performers and needed time and SEO to get well ranked. What I am finding now is that if you build a site that is well optimized right from the word go, you can hit the home page in a low-competition market or at least page two in a higher competition market. Moral of the story- optimize out of the box.